IDEO visual layout to help walking through ideas. Big ideas fuel the entrepreneurial spirit. An idea passionately pursued through a labyrinth of “what-ifs” can be the launch of the next great company, the new skyrocketing startup. Apple, under the leadership of Steve Jobs offers an example of a company built on a foundation of big ideas. With a storied reputation of innovation, Jobs and Apple seemed to have captured the magic of having the right idea at the right time over and over again. But this magic is misleading. We applaud the genius of those like Steve Jobs for big ideas that transform our perceptions about what is possible. However, we fail to recognize the work that got him there. For every ‘Steve soundbite’ we remember today, there were weeks of intense development, preparations and actual rehearsals – all that just to present the idea. It was never the right idea at the right time but an idea that was thoroughly explored and improved over a period of time. This is the most important lesson aspiring startups and entrepreneurs can learn from Jobs and other big thinkers: how to give space and time to discover, explore and convey big ideas. We live in a world where people are sharing more ideas than ever. We have more status updates and instant pictures than we can possible consume. But just as the rise of fast food gave rise to slow food, what will the reaction be to a world summarized in 140 characters? We’re producing more updates at an increasingly rapid rate, but at the same time, where does this leave our ideation process? All businesses, but startups in particular, are under enormous pressure to deliver a continuous flow of big ideas to maintain a competitive advantage and meet economic goals. In fact, as businesses continue to outsource standardized business processes, the ability to think creatively is crucial to moving up in the value chain. An express example of this is printed on the back of your iPhones: “Designed by Apple in California. Manufactured in China”. While there is a demand for big ideas, flawed approaches fail to give space to truly out-of-the-box thinking. We often associate the big idea with a singular moment in time when an ethereal concept lurking in the subconscious finds its way to our conscious mental understanding. It is the “eureka!” moment when scattered pieces coalesce to give birth to an idea. But the “eureka” moment is a myth; big ideas need space to breathe, and develop. 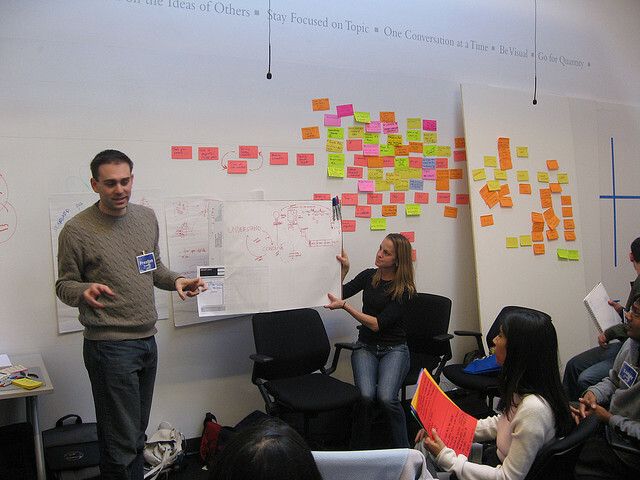 The idea creation process is then followed by a great deal of rehearsal for the presenting or communicating those ideas to an audience. Street artist JR is probably one of the most celebrated artists of recent times. His mission is to change the world with art and he has been working towards this over the course of his career. In a recent year-long photography project he set out to humanize historical events by showing people left behind. He recounted this endeavor at TED upon winning the TED 2011 prize. For a project that was years in the making, he communicated it to the audience in six minutes. So if there is a demand for big ideas what can we do to come up with them? It turns out there is a science. We need space to think big, metaphorically and physically. The role of space is essential to creative exploration and free thought. In fact, cognitive neuroscience studies have demonstrated that a sense of location helps us to make connections and remember details. The ancient Greeks provided an illustration of how space can help us to plan the communication of big ideas. They memorized speeches by laying things out in their living rooms. Moving between the kitchen table, chair and the sofa helped them understand relations and recall information. Through arranging ideas in one space and illustrating them via a cinematic walkthrough, they could connect ideas in a memorable fashion and design talks that stuck with their audiences. Today some of the world’s best ideation companies like Duarte Design, Gensler and IDEO use space to form connections and determine how to tell the story effectively. By adopting a modern take on the Greek’s method of Loci, these companies use big surfaces like walls, tables and whiteboards to walk through ideas. The canvas allows creative freedom to explore ideas and enables a story to develop without the constraints of preconceived templates. For audiences it the big space that gives context, a sense of where we’re coming from and where we’re going. In an age of bite sized communications, the big idea stands out. But it doesn’t have to be one or the other. Entrepreneurs can tap the power of compact, instant updates to ignite the questions that can lead to deeper exploration. Short form communication can satisfy our very real need for social interaction, but leave room for ideas with deeper meaning, ideas that may that lead to the next Apple, Facebook or Amazon. A real-time flow of updates only increases the demand for food-for-thought and the development of big ideas that will have impact and be remembered. A propos de l’auteur : Prior to joining Prezi, Peter Arvai established healthcare startup omvard.se and was part of creating the first mobile news reader.